We're pleased to announce a number of changes designed to help with the management of route directions for individual routes. Firstly, we added in the ability to change the default turn arrows generated when you plot a route. These are chosen automatically based on the shape of the route, but you can now override them if you wish when editing the directions. Secondly, we've introduced a new option to display turn arrows on the map, so that you can see at a glance where all the important turns are. You can easily toggle the display of these turn arrows in the same way as you can for symbols, labels, direction arrows and distance markers. And, if you have turn arrows displayed, these will also be shown when you print a route map or when you download a route map as an image file. Next, to assist with navigation of routes on GPS devices, we've amended the route directions to automatically add a FINISH at the end of the route. This also means that the print outs with directions will now include an ETA for finishing the route, if you have the Timer feature turned on when printing it. Lastly, we've amended our GPX download feature to make use of the full Garmin symbol set. Previously a waypoint was created for each of the directions with the default Blue Flag symbol, but now if you've chosen a symbol in the route planner to associate with one of the directions, a corresponding Garmin symbol will be used for the waypoint in the GPX file, provided that a matching symbol exists. The Garmin symbol set is fairly limited though, so the Blue Flag will still be used where a corresponding Garmin symbol is not available. Thankyou so much. Now this is really the best place to create routes. It's really great that you reach the 'edit course point' dialogue directly by clicking the symbol on the map. - When deleting a course point from 'edit course point' dialogue, the map is not updated and the direction on map is still clickable even though I don't think it exist anymore. - Is FIT download also going to support Garmin symbol set when downloading? If I have both a direction and a turn arrow assosiated to a direction, which one will be exported to file? - I would really like to see all directions on map, even though they do not have any turn arrow symbol. 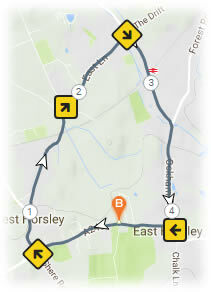 Hi, whenever I download the route image the turn arrows are displayed regardless of them being turned on or off. Am I missing something obvious? We've fixed the bug with the image download now. We'll look into the delete coursepoint issue and get this fixed later today. The Garmin symbol set has only been implemented for GPX downloads at present, so won't affect FIT downloads. 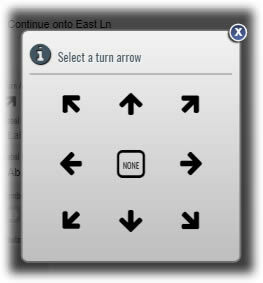 I can see the problem with hovering over the turn arrow symbols to view the directions. I think we could struggle to find a solution to this, but we'll look into it. Thanks for thew suggestion about showing all directions on the map. Obvioulsy we wouldn't be able to display all the text on the map as it would be too cluttered, but we could possibly show numbered symbols that you could hover over to see to text. I'll add that to the Feature Requests list. Maybe just show the same yellow square with a dot in the middle if there is no turn or other symbol. Then you could easily click on it and reach the edit dialogue for that direction. The next step is very necessary. 1. Checkmark - add/not add the waypoint in the file. Thanks Mikhail, I've added those to the list of suggested enhancements. Bring in at the beginning, the continued development is great. Horse riders appreciate this.